My laptop has a webcam, now what? So many teachers and student use these things around here, I wonder if other people need to know the power? It was the catchiest title I could come up with and I am working on a theory that catchy titles are the key to presenting. See attached photos of slides. They will not be of much value since they each need the story and the slides do not have video. Sorry no audio. I wish I had the ability to remember to record myself at these things. I love presenting. It forces me to reflect on my teaching and tech coordinating and bring out in front of people what good is happening around me. I tried out two specific new things this year that I think may have helped. First, I spent a lot of time on my title. It may not seem like it but I did. The title above is the best I have ever had. I liked that it was current: many PC people are new to having a webcam. I liked that there was no mistaking what the presentation was going to be about. I thought it communicated that there would be stuff in here to try out on Monday (a way teachers often decide what to do at conferences) while I knew I would get at picture theories of education during the whole thing. I wanted more than my current average at MACUL of 15 people in the room. Second, I think I realized that there are three tiers of presenting at conferences. First tier is the true story tellers with a big philosophical point. Dan Meyer, Alan November, Will Richardson, David Warlick, Gary Stager all weave stories and presentations to make you think big thoughts. Second tier presenters show you a lot of things that you can do and try to weaver their big picture stuff into that. I think this is second tier because I might only get a few nuggets out and I will probably have to find them myself a little. Plus it is easier to make these presentations. Line up 25 good ideas and go. There is another tier but I would like to stay positive. If you look at the slides, my presentation was essentially 21 good ideas about using webcams. 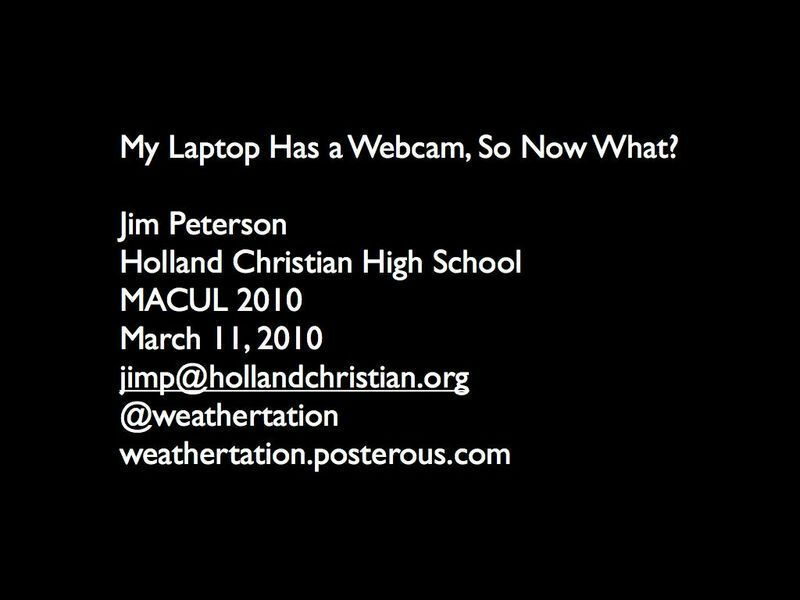 I weaved through that some good rules of teaching, and how to use other devices than webcams that you may have around to achieve some of the same goals. I was really happy with how it came together. I think my title worked. I had about 50 or 75 people at the presentation. The room was pretty big, so it was not full, but close. Aside from my title I was in the room that on the program had me right below all the headliners. That probably helped. The room I was in was literally the farthest room from anything, which might have hurt. I was very happy with the turnout. And I think no one left, which is another good sign for my title. I got a lot of positive feedback from the people who stayed after as well. I could do some things better. I need to put my slides up before the show so that my sharetabs.com link includes a link to the slides. I need to make my sharetabs.com before the morning of the event. I need to be ready to present 20 minutes early so I can greet them at the the door. By ten minutes left when I was ready to meet people at the door the room was half full. By the way, greeting people at the door is an essential and under utilized presentation technique. I should consider the whole presentation being websites, although with all the videos that are of unknown copy write status, I really could not. I should have short Google Form for evaluation that people can go to for feedback. Overall I was really happy. The audience really tracked and seemed to enjoy it. I was very comfortable. I am glad MACUL sees fit to continue to allow me to present. Now I just have to think of a topic.